PayPal has been one of the largest online payment systems used worldwide. Those who work from home, and have never used Paypal, may wonder why so many prefer this payment method over the others. After you review the following three advantages of using Paypal to get paid for your time, you will most likely start using it yourself. 1. Saves Money: The most popular reason most companies use Paypal is that it's completely free. There are no sign-up fees, membership fees, or annual fees involved. Workers using Paypal get the advantages of using the service without costing anyone a dime. 2. Secures Credit Card Information: Another reason for using Paypal is it secures credit card and personal information. When you sign up for a PayPal account, you can link your credit card or bank account with no worries. You will only need to do this at the initial sign up and will not need to disclose this information again. By accepting payments via PayPal, you can receive your money and transfer your funds to your bank account, without worrying about a company hacking into your account. 3. Lost or Stolen Payments: By using Paypal, this will save you from the hassle of having a check lost or your money stolen. Paypal secures your funds and verifies each transaction. I also recommend getting a Paypal debit card for easier access to your cash balance. Don't worry, Paypal debit cards are free. 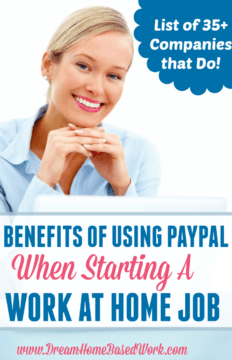 Which Work at Home Companies Pay through Paypal? If you are wondering which companies use Paypal for sending payments, I have gathered a big list of companies that will. Amazon Mturk – (Read more) Micro jobs and online tasks. Call Center QA –Read more– Telephone mystery shopping. Cash Crate – Take online surveys, play games, and more. Call Rev – Get paid to transcribe phone calls. Pay is weekly. Clickworker – Clickworker pays you to complete a variety of micro-tasks. One Space – Micro jobs and simple online tasks. Ebates – Earn cash back for shopping at your favorite online stores. Good Call – Get paid to make sales phone calls. Pay is weekly. HireWriters – Get paid to write SEO articles online. Payments are done weekly on Fridays via PayPal. Chegg –Read more– This company has online tutoring jobs that pay $20 per hour helping others online. The pay is weekly. Fancy Hands –Read Review– Micro jobs and virtual assistant tasks. Gympact – Smartphone app that pays you to lose weight and track your meals. Humanatic – Review and sort phone calls from home. iBotta – Smartphone app that pays you cash back for grocery shopping. iPoll – Get paid for sharing your opinion. Receive $5 just for signing up. Opinion Outpost – Take online surveys for cash. 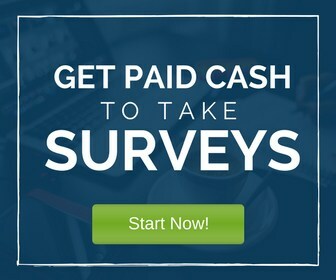 Paid Viewpoint – Make money online by taking short simple surveys. Postloop – Get paid to post and comment on forums and blogs. Receipt Hog – Smartphone app that pays you scan grocery receipts. Rev – Transcription, book research, and more. SigTrack –Read more– Data entry work. Slice the Pie – Get paid to review music online. Swagbucks – Take online surveys, play games, watch videos, and more. Task Rabbit – Read Review– Get paid to run errands and complete micro jobs. Textbroker – Freelance writing work. Toluna – Earn money by taking online surveys, free product testing, and more. User Testing -Website testing company that pays $10 per every website you reviews for 10-20 minutes. Userlytics – Website Testing company that pays $10 per site you visit. VerbalizeIT – Translation, interpretation, and transcription work. WhatusersDo -Website Testing company that pays $8 per site you visit. How To Sign Up for A Paypal Account? To get started visit their official site here – http://www.paypal.com. Click on the “Sign Up” button. This button is located in the top right hand corner of the site. Select the Type of Desired Account. A personal account is FREE, if used for collecting money, sending funds, and buying goods or services. For a business account, you will have two options: Standard account which is free, or a PRO account that is a monthly fee of $30. Enter your Email and Create a Secure Password. Please note: This is the email you will use to collect or send payments online. Hi Lashay, I must have forgotten but I did sign up for a Paypal account, but I do want to ask a few questions as this is my first time. 2) As for verification purposes, do I have to put in my middle name? I included my middle name on my bank account and I was just wondering if I also have to put it in on my paypal account so as not to have any problems with verification? Thanks! Hi There! You can receive payments with just a personal account. I would only recommend a business account if you plan to sell items and/or make business transfers. Your middle name is not necessary, just your first and last. I see, but is it true that with a personal account, there would be a limit on the number of payments you can receive say in a certain time period? FYI, Appen pays via PayPal, too…but in Australian dollars (at least for the projects I’ve worked on). When converted into US dollars, this ends up being less, since the exchange rate isn’t favorable to us at the moment. Hey Katya! Thank you for sharing:-) I’ll add them to the list! Thank you for sharing this. I love to see positive women giving positive advice. God Bless and take care. Aww..Thanks a lot Emerald. Blessings to you and yours! Unfortunately its not true that PayPal doesnt cost anyone.